this CG CRPF Recruitment 2018. 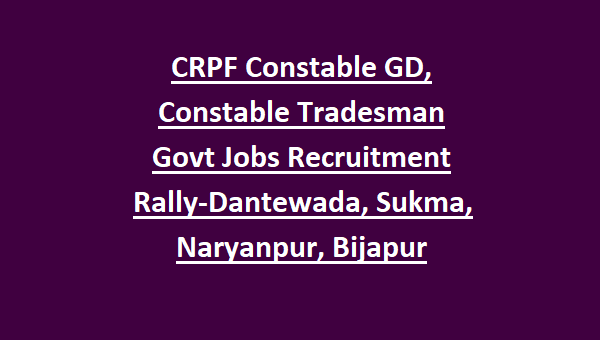 Both Male and Female candidates are eligible to attend the recruitment rally for this CRPF Recruitment of Chhattisgarh state Constable GD and Tradesman jobs. Candidates must have submit application form at the recruitment rally and must have shown original documents for verification. Candidates selection for this CG CRPF Constable jobs will be based on Physical Tests and written exam. For CG CRPF Constable GD jobs recruitment rally will be held form 20-08-2018 to 25-08-2018 and for CT Tradesman from 27-08-2018 to 31-08-2018 in the given districts of Sukma, Narayanpur, Dantewada and Bijapur. 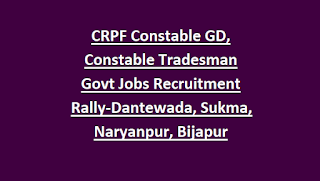 More information related to this CG CRPF Recruitment of Constable GD/Tradesman vacancies, age limits, physical standards tests and physical efficiency test details updated below. Total are total 139 vacancies are going fill through the recruitment rally of CRPF. District Wise CRPF Constable Tradesman vacancies are given below. 1. 20/08/18 to 25/08/18 for Bijapur district. 2. 20/08/18 to 25/08/18 for Dantewada district. 3. 20/08/18 to 25/08/18 for Sukma district. 4. 20/08/18 to 25/08/18 for Narayanpur district. 1. 27/08/18 to 31/08/18 for Bijapur district. 2. 27/08/18 to 31/08/18 for Dantewada district. 3. 27/08/18 to 31/08/18 for Sukma district. 4. 27/08/18 to 31/08/18 for Narayanpur district. For Recruitment Rally Venue details refer official notification. 10th passed candidates can attend the recruitment rally. As on 01-08-2018 age limits are 18-33 years. Remember this notification is only for ST candidates. Candidates selection is based on physical standards tests, physical efficiency tests and medical tests. 1.6 Km running to be completed in 08 minutes & 30 seconds. 1.6 Km. race to be completed in 12 minutes. For Constable tradesman posts Trade test will be conducted on the same day of PET/PST. Candidates must have submit the application form at the recruitment venue on recruitment rally date itself along with passport size photos, all other required documents. Make your own arrangements for physical tests.